Some months ago I became fascinated with the complicated linkages that Festo had created for their haptic telepresence hand. It appeared, at first blush, to be a brilliant innovation in that the same linkages could be used in both the interface with the human and and its mechantronic counterpart. I spent my spare time over two months reverse engineering the linkages only to discover that while it would allow movements necessary to pick up objects like the one shown in the photo, one could not grip any but the most heavy handled tools. 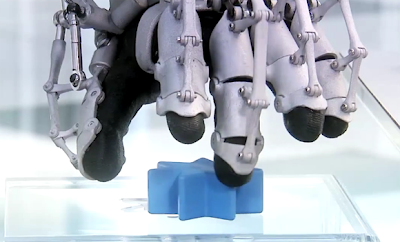 In short, you couldn't make a fist with the Festo hand. Sorely disappointed, I set about to create a linkage that would allow that sort of gripping motion with a minimum requirement of actuator and feedback. In the past few weeks I've made a bit of progress. The approach needs a lot more work, but the principle seems sound enough so far. I'm up to my Mk3 hand, which will have open hardware covers. Anyone can download and change them. I'm hoping that people can add their own electronics to it as well. Hi Chris! Great to hear from you. You really ought to get acquainted with Andreas Maryanto in Indonesia. His Dexhand project is a continuing effort now for some years and is well worth keeping track of. Good luck with the crowdfunding. I've been thinking about making an offering through that funding method.